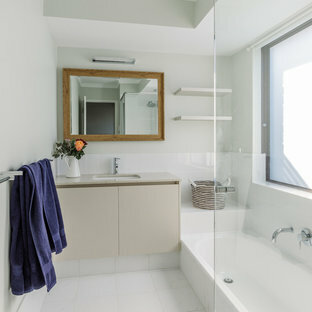 This is an example of a small contemporary 3/4 bathroom in Sydney with a corner shower, a one-piece toilet, beige tile, white walls, marble floors, a wall-mount sink, beige floor and flat-panel cabinets. Floating stone bench with Laufen basins and mirrored overhead cabinets such beautiful attention to detail. 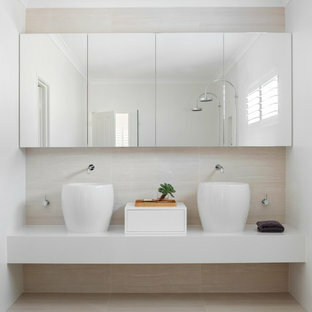 Photo of a contemporary bathroom in Perth with beige walls and a vessel sink. 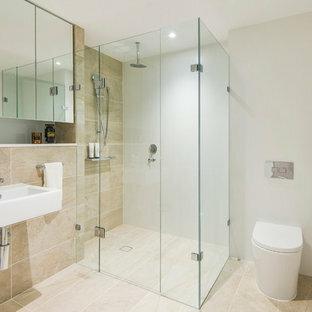 Design ideas for a contemporary bathroom in Perth with flat-panel cabinets, beige cabinets, a drop-in tub, a curbless shower, white tile, white walls and white floor. 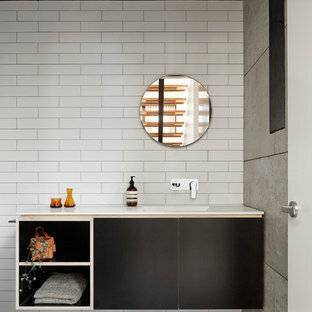 Contemporary bathroom in Melbourne with flat-panel cabinets, black cabinets, white walls and an integrated sink. 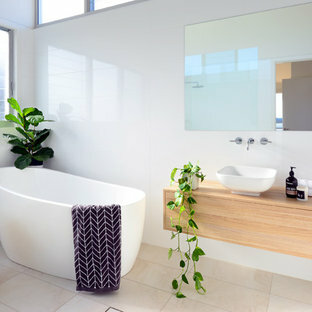 Inspiration for a small contemporary 3/4 bathroom in Wollongong with a freestanding tub, white tile, ceramic floors, a vessel sink, wood benchtops, beige floor, flat-panel cabinets and medium wood cabinets. 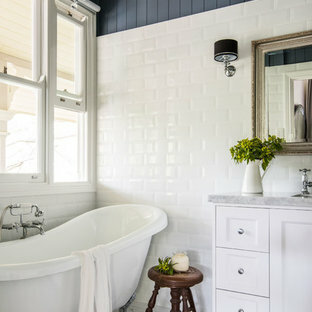 Design ideas for a mid-sized country master bathroom in Brisbane with white cabinets, a claw-foot tub, white tile, subway tile, blue walls, porcelain floors, a drop-in sink, marble benchtops and recessed-panel cabinets. 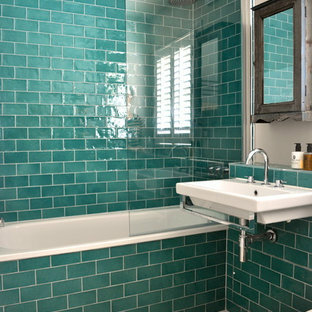 Transitional bathroom in London with a wall-mount sink, an alcove tub and blue tile. 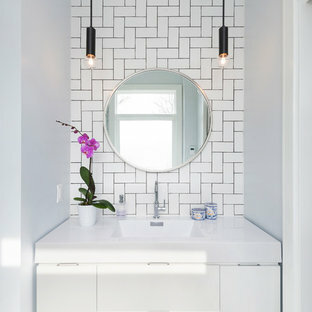 Small contemporary master bathroom in Toronto with flat-panel cabinets, white cabinets, white tile, subway tile, white walls, marble floors, an integrated sink and solid surface benchtops. Mid-sized scandinavian master bathroom in Los Angeles with flat-panel cabinets, light wood cabinets, white tile, white walls, ceramic floors, an undermount sink, engineered quartz benchtops, white floor and a freestanding tub. This is an example of a mid-sized contemporary master bathroom in New York with flat-panel cabinets, white cabinets, an alcove tub, a shower/bathtub combo, a wall-mount toilet, gray tile, porcelain tile, grey walls, mosaic tile floors, a vessel sink and grey floor. Inspiration for a transitional master bathroom in Los Angeles with furniture-like cabinets, light wood cabinets, white walls and an undermount sink. 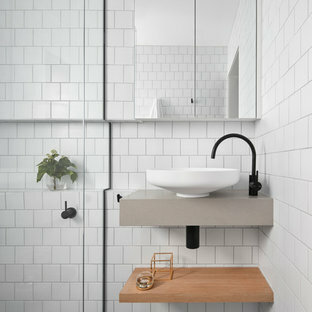 Design ideas for a small contemporary 3/4 bathroom in Seattle with flat-panel cabinets, grey cabinets, a curbless shower, beige tile, white walls, a vessel sink, grey floor, a two-piece toilet, porcelain tile, concrete floors and solid surface benchtops. Inspiration for a traditional powder room in Portland with multi-coloured walls, a console sink and marble benchtops. Inspiration for a contemporary master bathroom in Tokyo with a freestanding tub, beige tile, beige walls, a shower/bathtub combo and a drop-in sink. Asian bathroom in Tokyo with white walls, a vessel sink, blue tile, mosaic tile, light hardwood floors and tile benchtops. The luxurious Calcutta marble is complemented by the crisp Benjamin Moore Moonshine paint and the texture in the marble mosaic floors is a perfect pair with the simple Bellmont 1900 white shaker cabinets. Caesarstone Calacatta countertops offer a modern twist on a traditional material. Frameless medicine cabinets along with glam Hudson Valley Lighting “Thomposon” sconces and polished chrome Top Knobs Hardware and Hansgrohe plumbing fixtures keep this master bathroom modern, chic and bright.